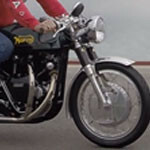 John Zainer of Los Angeles, California shows us his beautifully restored Manx inspired 1956 Norton Dominator 99. 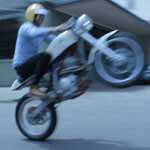 Thor Drake of See See Motor Coffee Company in Portland, Oregon shows us his custom Honda XR 400 based Cafe Racer. 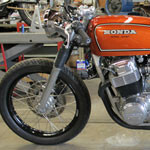 George Kassapakis of See See Motor Coffee Company in Portland, Oregon shows us his custom Yamaha RZ 350 based Cafe Racer. 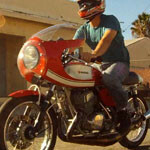 Jeff Walters of North Hollywood, California shows his custom two stroke 1976 Suzuki GT500 cafe racer. Riding video shot with the GoPro Hero 3+. 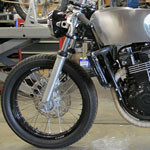 Jeff Tower of Twinline Motorcycles shows us the custom 1977 Honda CB 550 that they created for Cafe Racer TV: The Thorn. 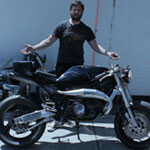 Jeff Tower of Twinline Motorcycles shows us the custom 1975 Honda CB 750 Super Sport cafe racer that they created for a customer over a two year period. 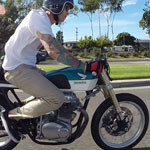 Chad Williams of Costa Mesa, California shows us his beautiful custom cafe racer that he built in his garage from a 1968 Honda CB350. Riding video shot with the GoPro Hero 3+. 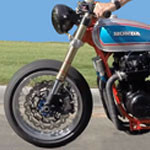 Stanley Tang of Aliso Viejo, California shows us his beautiful custom cafe racer that he built in his garage from a 1982 Yamaha Virago XV750. Riding video shot with the GoPro Hero 3+.